A new study led by scientists from the Arctic University of Norway has detected “extreme levels” of Roundup, the agricultural herbicide manufactured by Monsanto, in genetically engineered (GE) soy. 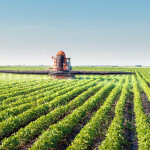 The study, coming out in June’s issue of Food Chemistry and available online, looked at 31 different soybean plants on Iowa farms and compared the accumulation of pesticides and herbicides on plants in three categories: GE “Roundup Ready” soy, conventionally produced (not GE) soy, and soy cultivated using organic practices. They found high levels of Roundup on 70 percent of GE soy plants. Crop scientists have genetically engineered soy to survive blasts of Roundup so farmers can spray this chemical near crops to get rid of weeds. But some so-called “super weeds” resistant to Roundup have developed. In turn, some farmers use yet more Roundup to try to kill those hardy weeds. This leads to more Roundup chemicals being found on soybeans and ultimately in the food supply. Who says when Roundup contamination can be considered “extreme?” Monsanto itself. In 1999, the chemical giant defined an “extreme level” of the herbicide as 5.6 milligrams per kilogram of plant weight. This study demonstrated that Roundup Ready [GE]-soy may have high residue levels of glyphosate […] and also that different agricultural practices may result in a markedly different nutritional composition of soybeans […] Lack of data on pesticide residues in major crop plants is a serious gap of knowledge with potential consequences for human and animal health. Other research has detected Roundup residues in animals and people. Big Ag wants us to believe that there is no difference between GE and conventional crops, but mounting research tells us that just isn’t true. Given its size and scope, when Monsanto pushes back, it usually gets what it wants. That’s why organizations like Food Democracy Now! want people to divest from the seed giant and it’s also why Sri Lanka is postponing its ban of the active ingredient in the company’s top-selling herbicide, Roundup. Less than a month ago a Sri Lankan minister told reporters that glyphosate would be immediately removed from the country’s marketplace because it was the main cause of a kidney disease epidemic. Suddenly, the country isn’t so sure about that. A previous Sri Lankan study by the World Health Organization detected glyphosate and cadmium, along with other pesticides and heavy metals, in kidney patients’ urine and in areas impacted by the disease, which also include Central America and India. Initially, Sri Lanka’s government believed scientist Dr. Channa Jayasumana’s theory that glyphosate bonds with toxic metals in the environment like cadmium and arsenic to create compounds consumed in food and water that do not break down until reaching the kidney. But now, the government has received complaints from Monsanto, other agrochemical producers and Sri Lankan officials like Registrar of Pesticides, Dr. Anura Wijesekara, all of which have led to halting the ban. Additionally, Director General of Agriculture Dr. Rohan Wijekoon told The Island that the Pesticides Technical Committee has requested a meeting with President Mahinda Rajapaksa about the “far-reaching repercussions” of the ban. A European glyphosate task force also continues suggesting there is no true link to the kidney disease. Still, an average of 13 people per day had been dying of kidney failure in Sri Lanka prior to Jayasumana’s study. The kidney disease was prevalent in at least 89 agrarian divisions in Sri Lanka. “Glyphosate acts as a carrier or a vector of these heavy metals to the kidney,” Jayasumana said. A 2012 Monsanto study suggested that glyphosate a less potent chelator for heavy metals like calcium, manganese and iron than other plant compounds, but U.S. Geological Survey hydrologist Paul Capel begs to differ. “As far as I know, there are no other common herbicides that would have this same sort of strength of interactions with metals,” he said. He added that glyphosate was also likely to bond with cadmium. 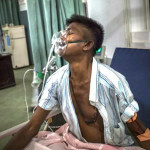 However, Jayasumana’s data that could link glyphosate to cadmium or arsenic have yet to published, though preliminary tests of well water consumed by Sri Lankan kidney patients found glyphosate with high levels of calcium and other metals.